HomeGovt-SchemesPM launched UDAN(Ude Desh Ka Aam Nagrik) Scheme. PM launched UDAN(Ude Desh Ka Aam Nagrik) Scheme. PM launched UDAN(Ude Desh Ka Aam Nagrik) Scheme. Prime Minister Narendra Modi will launch regional air connectivity scheme from Shimla. 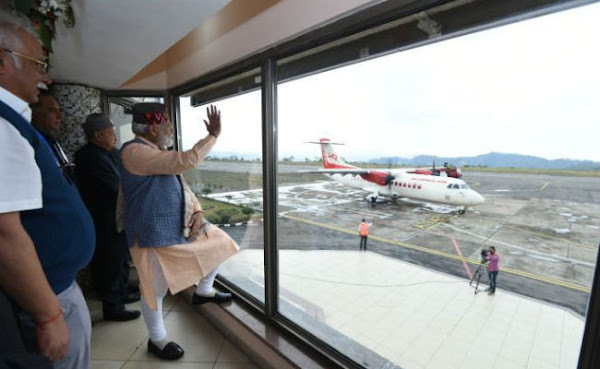 PM Modi will flag off a flight from Shimla to Delhi to launch the ‘UDAN’ (Ude Desh Ka Aam Nagrik) scheme which is aimed at boosting regional connectivity. Simultaneously, flights will be launched on Kadapa– Hyderabad and the Nanded-Hyderabad sectors. “This with proportionate pricing for routes of different stage lengths and flight duration,” it said. According to an official statement, 24 airports in the western region, 17 in northern region, 11 in southern region, 12 in east and 6 in north-eastern parts of the country are proposed to be connected under this scheme. Under this programme, the government intends to connect 45 unserved and under-served airports. The selected airline operator would have to provide 50 per cent of the flight capacity with a cap of Rs 2500 per hour on fixed wing aircraft and a minimum of 5 and a maximum of 13 on helicopters with the same price cap. State governments will provide a certain share of VGF. 19 States and 3 Union Territories have signed a Memorandum of Understanding for this purpose. The UDAN scheme aims to stimulate regional connectivity with flights covering distances up to 800 km through a market-based mechanism. 43 cities are expected to be mainstreamed on India’s flight connectivity grid. A dozen airports where limited but irregular flights operate will be connected. As many as 31 destinations that are not operational despite the existence of airports will become active. Air India’s subsidiary Alliance Air will be the first airline to start operating flights between Delhi and Shimla under the Regional Connectivity Scheme (RCS). Alliance Air will operate regular flights using a 48-seater ATR-42 all-economy class aircraft from April 28. Due to the short runway length, height and temperature restrictions, the aircraft will not be able to fly the total capacity of 48 passengers. In the Delhi-Shimla leg, the flight will carry 35 passengers while on the return only 15 passengers will be able to fly. The government is expected to compensate for the loss with a Viability Gap Funding (VGF) of about Rs. 3,000 per seat. The VGF will be used to bridge the gap between the cost of airline operations and expected revenue. Airline operators would be extended VGF estimated to be around Rs 205 crore per annum for the operators chosen in the first round of bidding. So far, 19 States and three union territories have signed a MoU for this purpose. Five airlines — Alliance Air, SpiceJet, Turbo Megha, Air Odisha and Air Deccan — were awarded 128 routes under the scheme after a bidding process. The government aims at making flying affordable by capping fares at Rs. 2500 per seat per hour. “Airfare for a 1-hour journey of approximately 500 km on a fixed wing aircraft or for 30 minute journey on a helicopter would be capped at Rs. 2,500,” the PMO said. The scheme is a component of the National Civil Aviation Policy (NCAP) which was released on June 15, 2016. Hyderabad-Cuddapah, Hyderabad-Nanded, Nanded-Mumbai, Chennai-Mysuru, Chennai-Salem, Mumbai-Porbandar, Kolkata-Aizwal, Pune-Nashik, Delhi-Dehradun, and Ranchi-Raipur are some of the other proposed routes.